Each time the U.S. makes a threat, calls for sanctions or takes military action against weaker countries, Putin opposes it. 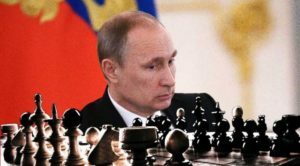 And each time, the U.S. hands another measure of the moral high ground, power and influence to Putin, who may be playing his game as well as his political opponent Garry Kasparov plays chess. We recently wrapped up a ten-year real-time study of Russia’s resurgence. In case you missed it, you can read it in full at the link below.